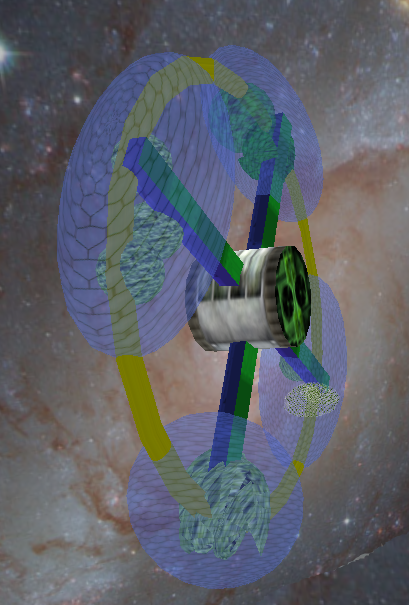 We can make space station that simulate the earth's gravity using centrifugal force. Generally for maximum comfort the centrifuge needs to be limited to 1 RPM and that leads to a diameter of about a mile (1.6 km). These are thus very big structures with a lot of material mass. OK in the zero gravity of space but you can't stand one on end on the moon. There is a way to put a centrifuge on the moon or an asteroid. This is to use basic railway technology to create centrifugal gravity. The centrifuge is a train with multiple carriages running around a track 1.6 km in diameter and as close to perfectly circular as possible. 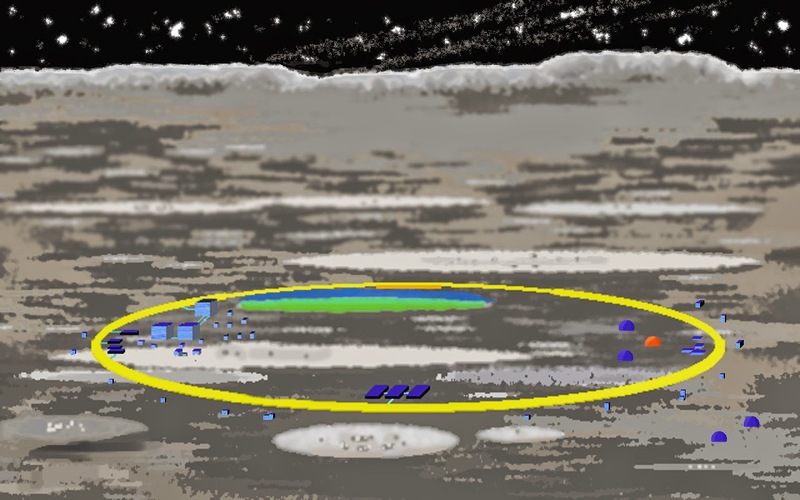 Either the track is banked or the carriages are built at an angle so that the centrifugal forces combine with the low gravity of the moon or planetoid to produce approximately one g.
The blue is the track with a large dome adjacent to it for low gravity recreation and some food and oxygen production. The Dome is stadium sized. Each carriage would be as spacious as a large train carriage. Some would be gyms for maintaining muscle tone and bone density by exercising in normal earth gravity. Some would be medical and maternity facilities to ensure normal recovery and normal pregnancies. Some would have apartments and hotel suites. In a well established base there may even be livestock stabled in some carriages. Luna 7 Tracked centrifuge and ancillary buildings and domes. Most structures are deep underground in the lava tube network. Unlike a larger space station the train stops regularly to allow people to come and go. Warnings are given so none are caught out. Many internal structures are designed with a radical change of orientation. The direction of down changes through 60-90 degrees. To generate one earth gravity the train must run at 239 kph an easy speed for magnetic levitation technology in vacuum or a thin atmosphere. Stopping and starting takes several minutes so there is time to find all the loose things lying around that may fall. This orientation when stopped. There is a possibility that the table and counter top might tilt. This model was in Second Life. The crew sit in a lounge near the table not on the blue seats. there is provision for standing at odd angles in the shower behind the floral screen, in the toilet opposite and beside the camera (Note: in the top hab image you see a grey/ white deck with the writing on it and the green box. I'm standing on the box in the second image. Select the box and stand ). The counter top has a kitchen bowl that is clam shell shaped. Thus it retains the water regardless of orientation. A spar bath in the gym would be the same only much larger. The first unit on the moon however would be small as the second life representation of a small habitat shows. It has three bunks, a tread mill for muscle and bone fitness and would be on an above ground track. A separate solar flare shelter would be near the track or one section of the track would be covered. A full sized flat car would look more like a luxury railway car. Image made with gimp from google images of search "railway luxury carriage"
These larger cars would not stop normally. Passenger transfer is by smaller cars running parallel on a track beside or under the main track. This technology is not just useful on the moon. There it allows large long term human population to live normally. The technology could be used on asteroids. There the gravity is so low that you don't need spare floors at strange angles. As the train slows down to a stop the gravity drops to zero. Your wash basin needs a lid not just a funny shape. 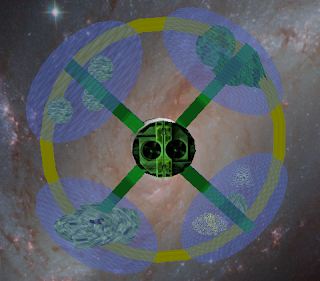 On this Asteroid we have two magnetic levitation train lines, yellow rings, as well as some domes for zero g gardening and several cylindrical building for zero g recreation and manufacturing, etc. the Black structure on the back of the asteroid is a solar furnace for power and metals smelting. The green domes are lit by free floating mirrors behind the camera. This asteroid could support 10000 people. I've also designed a free flying space station. This has the lowest mass to crew ratio of any design with centrifugal gravity. The twin trains run in opposite directions within the yellow ring. This is shielded with water tanks, storage spaces and space slag. The Sphere has a double geodesic shell with water in the gap for shielding and thermal control. 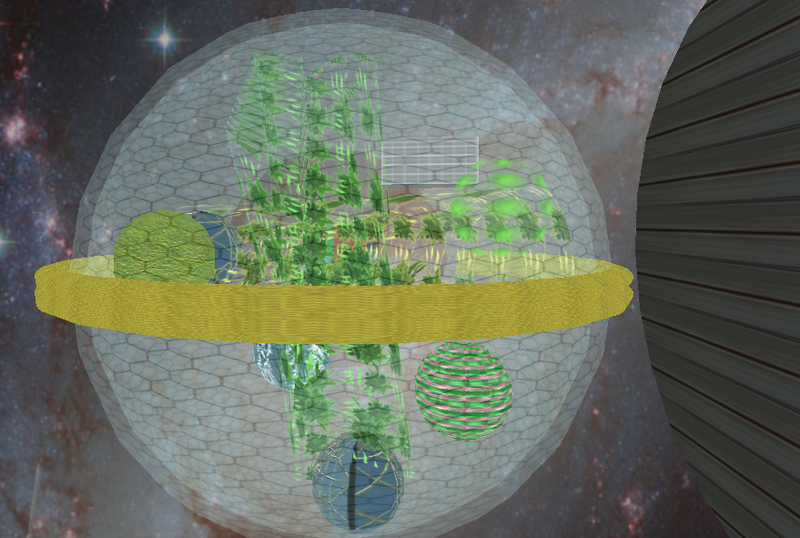 The internal spheres are farms with shielded stowage for zero g planters. 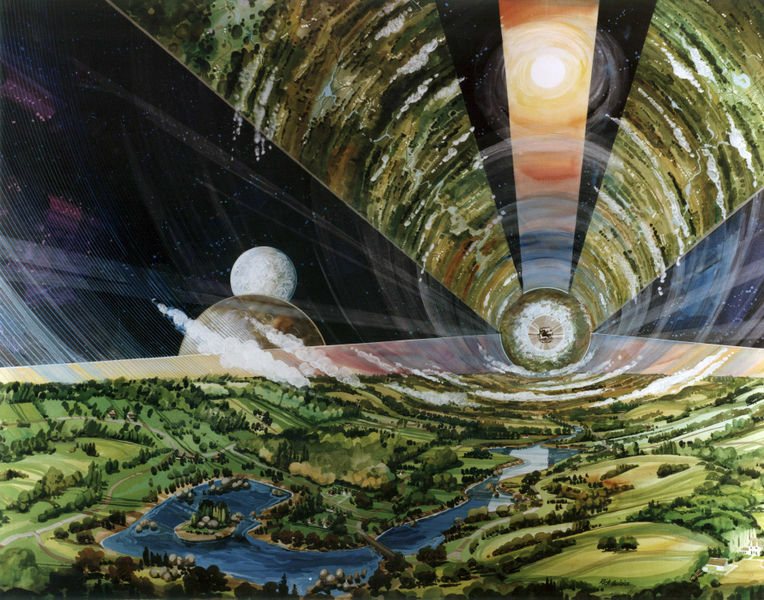 The geodesic spheres entire volume is pressurised as a large zero g recreational habitat. The large dark thing on the right is a solar shield. This reflects the suns radiation away, provides some radiation shielding and a safe place for ships to dock. The station and the shield are linked by a pressurised cable car and perhaps a few long torsion spars. Sun light is provided by a steerable free flying mirror that give controllable day length and temperature control (black ellipse above. Your seeing the back of the mirror ). 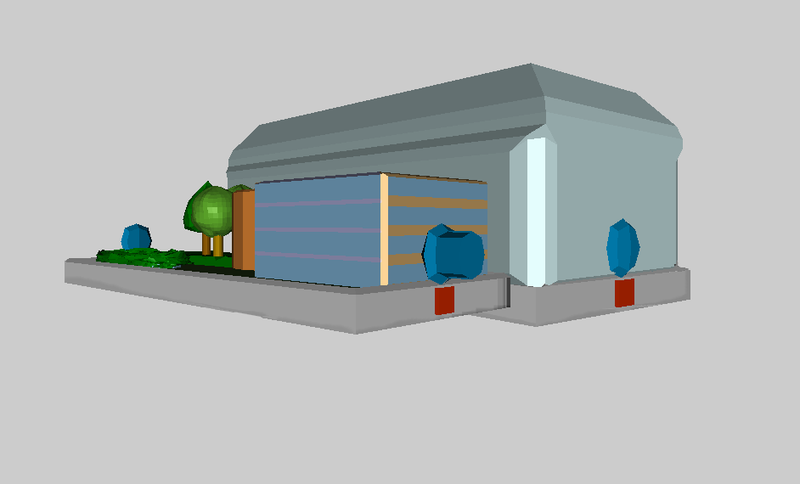 This structure would support 5000 people with some farming or gardening in the carriages and smaller centrifuges. Here's another design. This unit might support 3000 people. 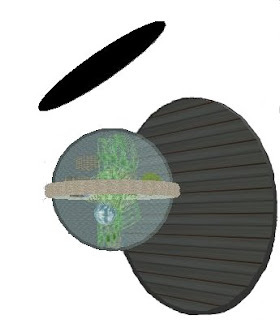 It would have the same shield and mirror technology as the sphere. Most people don't know that plants have been grown successfully in zero g on the various space stations. Plants like gravity but a few days as a seedling in a small fast centrifuge will suffice. Plants don't get dizzy. Plants on the International space station. 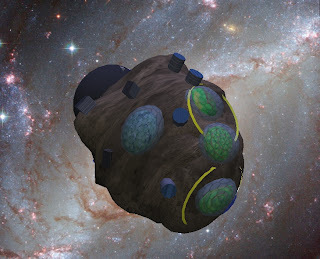 In case your worried about radiation hazards all the banked track systems on the moon, asteroids and space-stations are either burred in the ground or armoured with a high mass non-rotating shell around the track itself. There would be provision to move planter pots and whole garden beds into shelters under the domes and inside larger solid structures. This technology will allow people living in space to have gravity when they need it and zero g for fun and research. Short exposures to normal gravity daily prevent bone calcium loss. By designing the cars to be used for about half the day time hours would suffice. Short periods of zero gravity should not harm anyone including embryos. Though that needs to be checked. While these space stations will never look like a chunk of earth transplanted into space, like the illustration below, they will be adequate and interesting. First illustration, the luxury train cars and the one above are from the web. The Third illustration is pure gimp and relatively new. The large multi-story car is sketch up. All other illustrations created in Second Life with some reworking in Gimp. Sorry the hab photo's are so dark. I stuffed up with the virtual camera. Lol. Sadly nothing lasts forever even in cyberspace and Space Destiny sim in Second Life with all my work is now gone. When a sim closes the prims are meant to shoot back to your player inventory but it simply could not handle 3600+ prims! I'm Wesley Farspire in Second Life but bigger worlds call me away most of the time. The centrifuge is a train with multiple carriages running around a track 1.6 km in diameter and as close to perfectly circular as possible. This is like the artificial gravity device I have in my book, only it is under ground in an asteroid, pods that come down a spiral onramp, match speeds , move over onto the train and dock in a groove at the top of the train. The loop is 500 meters in diameter with carrages like bigelow 330s. They would travel at 1.89 rpm to get 1g. Each loop would have 100 carriages, and a population of 800. 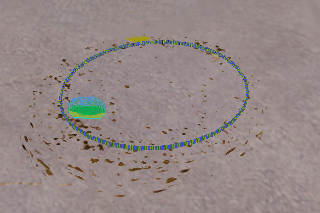 As the populatio grows more tracks can be build below. The power would be nuclear fusion, until they could build a great cylinder habitat.